Time to get back: back to school, back to business, back to the grind that is French life. Although you might think this would mean long faces, around here it seems that getting back to work gives us a lot of reasons to smile. I’ve posted before about how this is my favourite time of year. And it’s not just for the school kids. Although I still have one (mostly) mature student under my roof, la rentrée is the start of a whole new year on many different levels. First, there’s la rentrée des vacances. The French are back from vacation and they are smiling, at least for the first week. We did not go away anywhere this summer. Instead, we took shorter breaks in the spring, then lounged around all summer while everyone else took off. Although we live in an area that is a draw for tourists, we still feel the deadness of the summer season. Shops close, streets are oddly empty, anything administrative gets lost in an overflowing inbox. We began feeling the first signs of life again last week. Traffic reports went from green to red, tanned faces appeared in the shops and long line-ups sprouted in the grocery store. Then, there is la rentrée politique. This means that the brief lull in rhetoric is over. My ears had barely stopped ringing from all the noise over Brexit and Trump’s latest antics. And with presidential elections in the offing next spring, French politicians are back with a bang. Nicolas Sarkozy broke the silence by officially announcing his run for a spot on the ticket in 2017. Since he declared his Republican candidacy with a proposed France-wide burkini ban, he will not be getting my vote. Today is la rentrée des classes. It’s back to school for the kids, which means we will see a lot of freshly scrubbed faces and bright new backpacks on the street. It’s been awhile since my kids were small, even longer since I went back to school myself, yet that buzz of newness and energy still gets me. The teachers have been back for a week already, having completed la rentrée des professeurs ahead of time to get things ready for a new crop of students. This means new security measures in schools, although I doubt they will be enough to reassure everyone after so many terrifying incidents in the past two years. I have been enjoying the rentrée audiovisuelle this week. My favourite French access-to-prime-time talk show, C’est à Vous on France 5, is back. Next week will kick off a new season of Le Grand Journal on Canal Plus. And I’ve just learned that Les Guignols, those political puppets extraordinaire, who were banished from the show last year having crossed some sort of line, will be back. In a week or two it will be time to sign up for activities: yoga, zumba, choir…I’m still debating what to make time for but have decided there will be at least one thing that gets me out each week! It seems there are lots of reasons to smile. The summer sun is still with us, yet there’s a chill in the morning air that heralds the change of season in a few weeks’ time. I love the fall, and I feel energized at the thought of getting back down to work again. What’s your favourite thing about la rentrée? Here in France our summer siesta has begun. This year more than ever, we need a break. I’ve written before about the fact that la pause estivale is sacrosanct in this country, about how they roll up the carpets while just about everyone goes on summer vacation. Between the bracketed holidays of Bastille Day on July 14th and le 15 août – one of many religious holidays inscribed in the French calendar – not much will move around here. Hopefully, not even the crazy people who want to kill us. For me, too, it’s a good time for a break. Time to step back from the routine of normal life and breathe a little. Stare at the sky, watch the grass grow. Think about some things, stop thinking about others. For the past few years, I’ve been working on a memoir about life in France. It’s been slow going as it spans almost thirty years and many different places and experiences. Recently I began work on what I thought was the final edit – and realized I am still in need of some major restructuring. So it’s back to the drawing keyboard. Sometimes it’s good to take a step back – you see things completely differently. If I hadn’t got some space between me and that draft, I might not have seen the cracks and the flaws. Like this picture of the formal gardens in Versaille. It took me a moment to see the other, surprising image there. I’m hoping a blogging break will help me gain perspective and see a lot more happy faces, Including all of yours. Hope you are heading off somewhere nice or otherwise enjoying life this summer. Please tell me all about it! After a week on the beautiful isle of Crete, I’ve revised the expression ‘It’s all Greek to me’ to mean something completely different. And I simply must share a few of the things that are all Crete to me. One of the things I love about living in Europe is how close you are to so many amazing destinations. Crete was a bit far for Easyjet: it’s fine for a quick hop but the seats aren’t all that comfortable for a flight of almost 3 hours. But the low-cost airfares make this an affordable destination for French travelers. The weather. We were worried that mid-October might be a bit late for the beach. We need not have feared. It was mostly in the mid-20s, although there were a few clouds and windy days with cooler temps. That did not keep me out of the water. 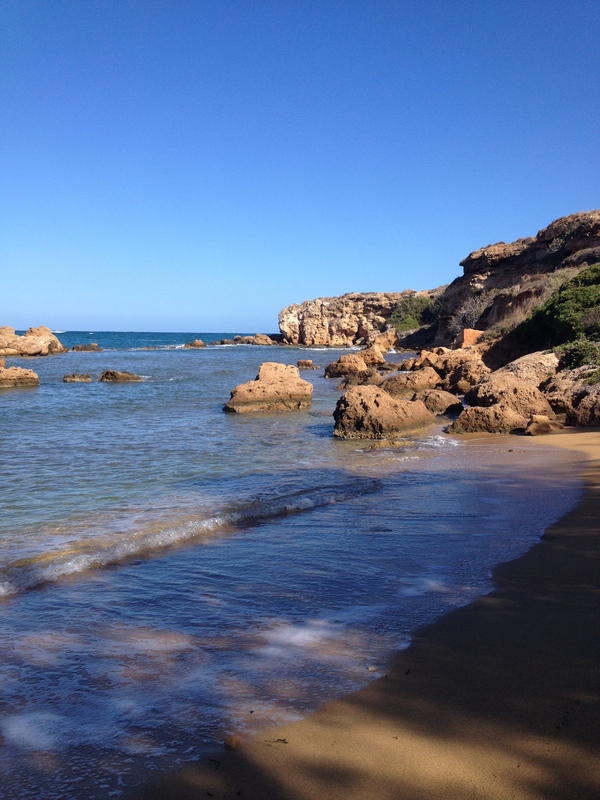 I love the salt water of the sea, and there were waves enough for a bit of body surfing. I am fair skinned and usually have difficulty staying put in the sun. But as the sun was weaker at this time of year, I was able to stick it out and have actually got a nice tan on my legs. Too bad it’s just in time to cover them up for winter back home! The beaches. 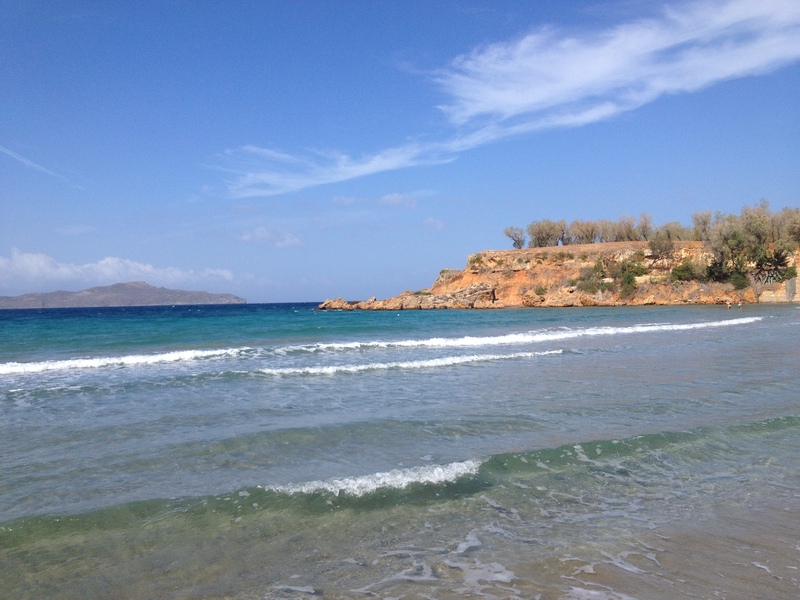 The sand on Crete is like brown sugar, and there is very little else underfoot. You can walk out a long way in the crystal clear water before it gets deep. Under the changing skies, the sea has more shades of cerulean than I ever imagined. The crashing of waves and cooling sea breezes were wonderfully relaxing. The food. 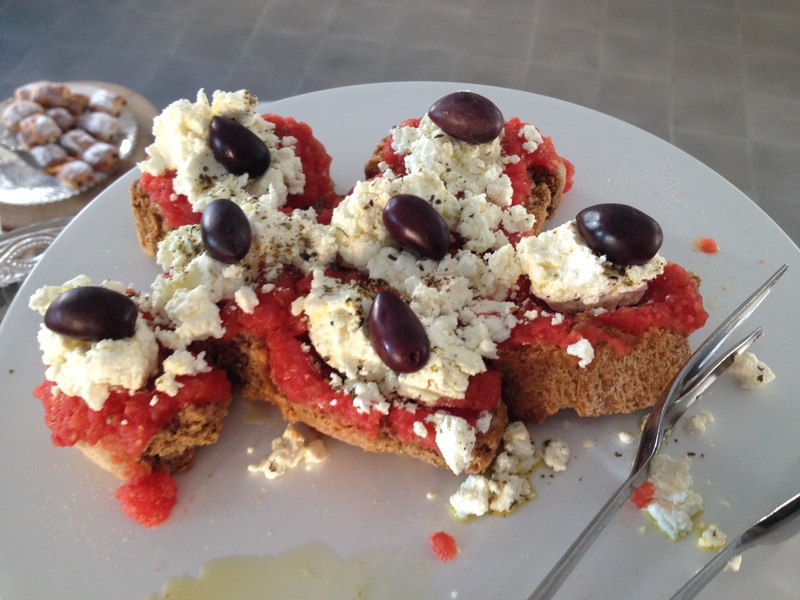 This is Cretan health food: Feta that fêtes the sheep, tomatoes so ripe they taste like sauce off the vine. Ubiquitous olives and honey and thyme. 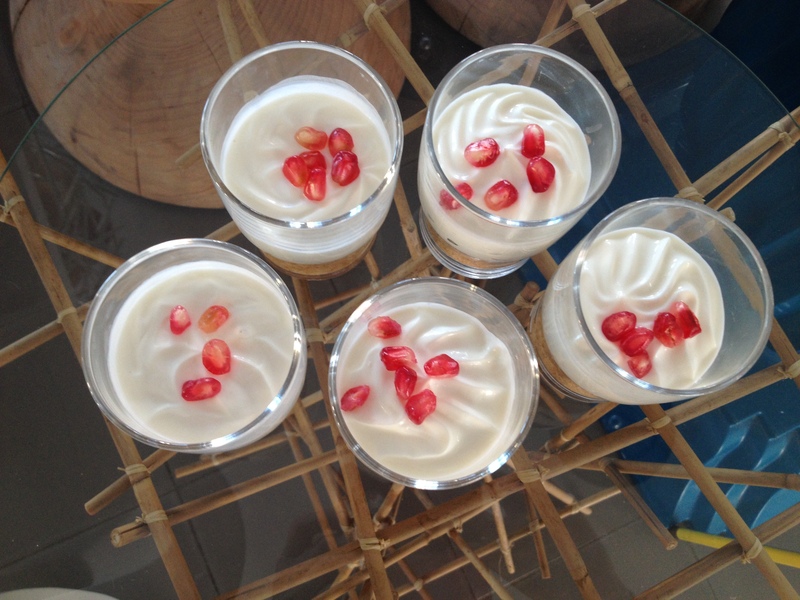 Yummy yoghurt thick as whipped cream. 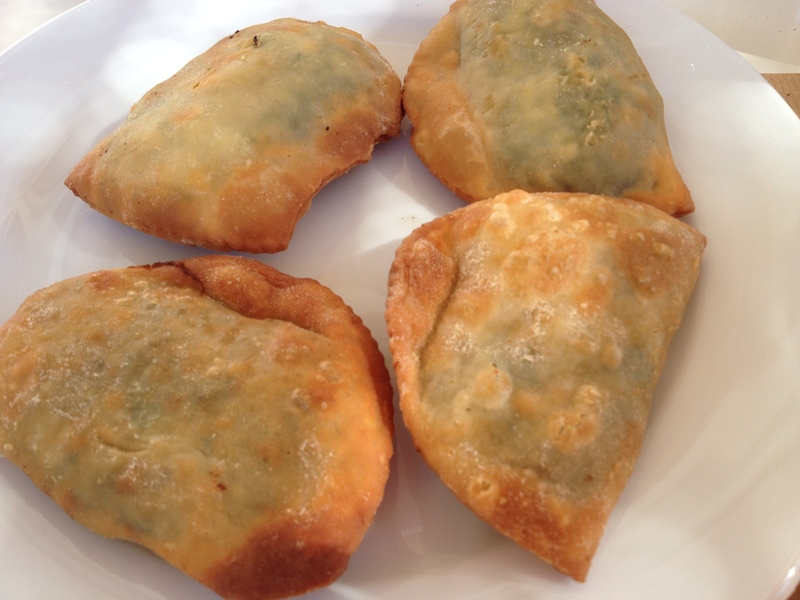 Pastries of fine phyllo filled with spinach and cheese. The drinks. Some very nice wines: Crisp whites, round rosés and reds of surprising depth. 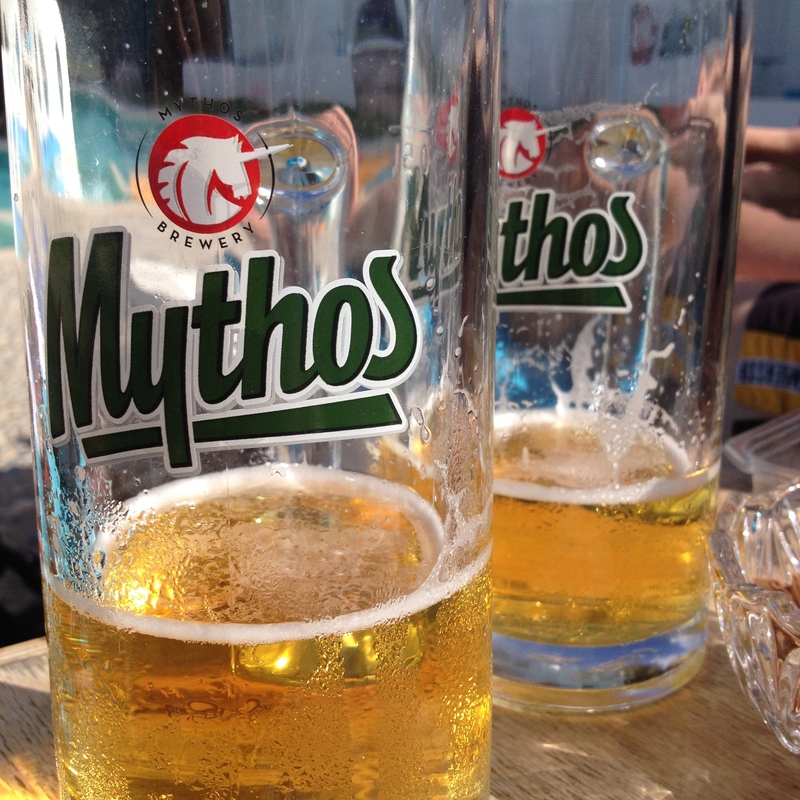 And damn good beer – Mythos – for me, the only drink on the beach. The fauna. Everywhere, cats. 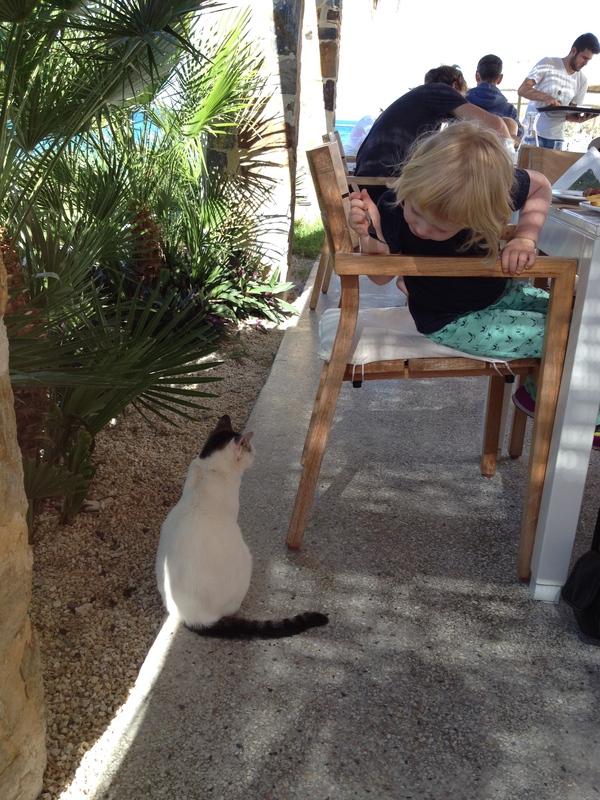 Feral, feline and offering hours of free entertainment. And kri-kri, the little mountain goats that give us such beautiful goat’s cheese. The fishing. 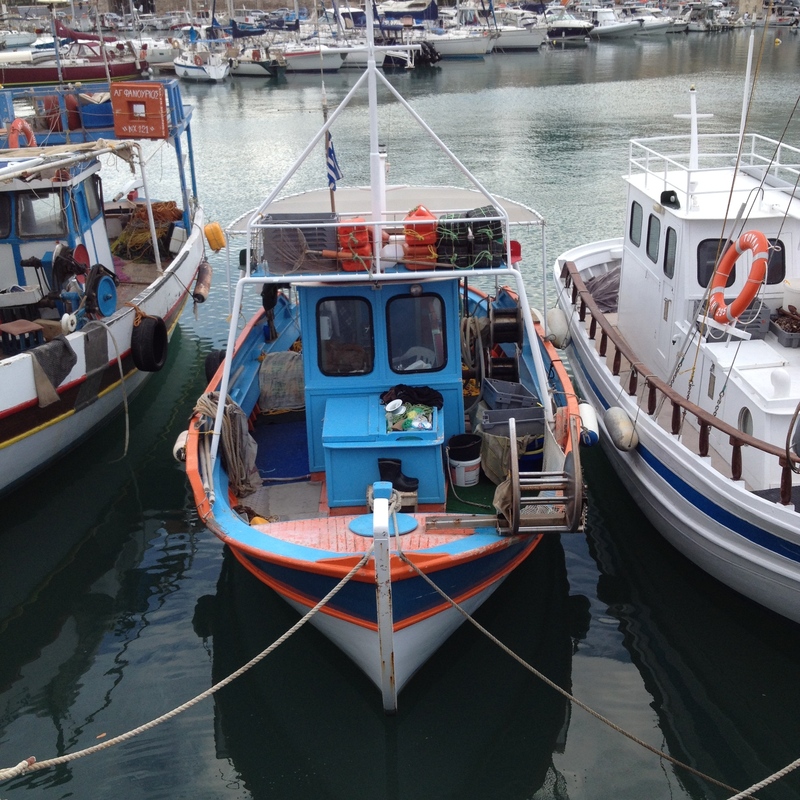 Harbors filled with fishing boats of every color. Who bring back the wonders of the sea. The Flora. Surprising in its colour and variety. Red earth and porous rock. Forests of tamaris trees. Dried golden stems and deep purple petals, sage green and yellow stars. 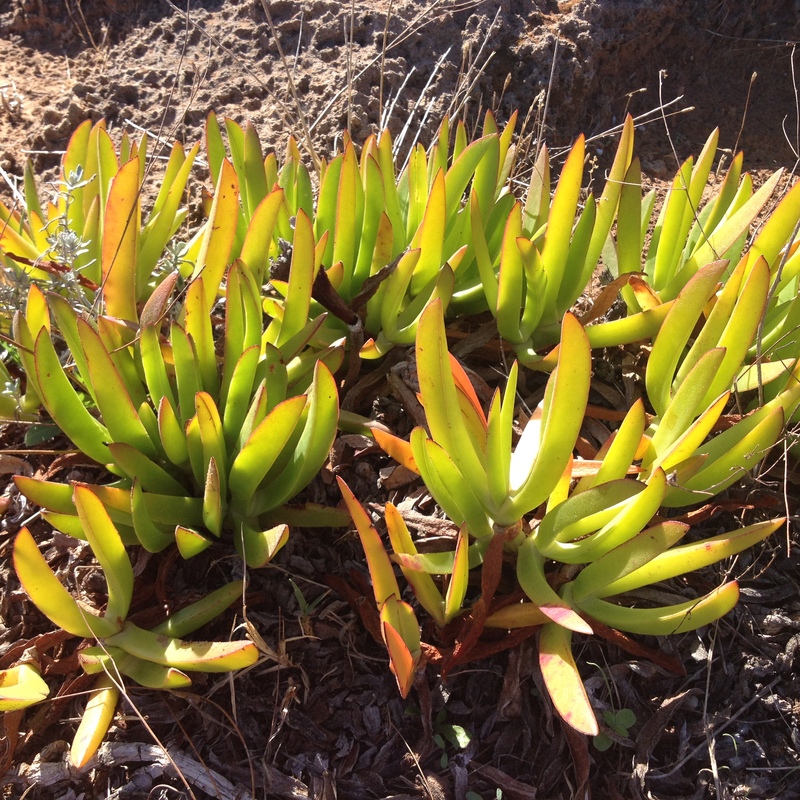 I returned from Crete restored and replenished, feeling like this plante grasse (succulent) that grows wild on Crete – plump little green stems all rosy on the tips. 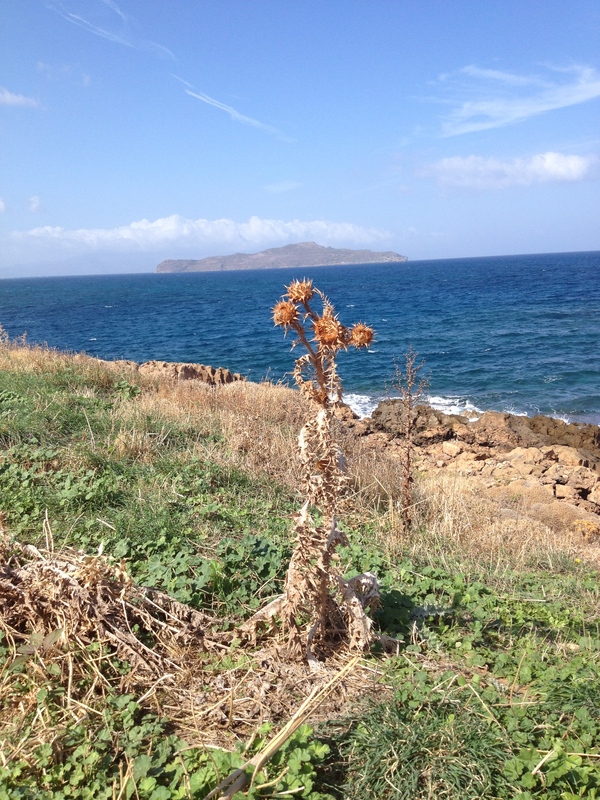 Have you ever been to the Greek islands? Do you have a favorite holiday spot? 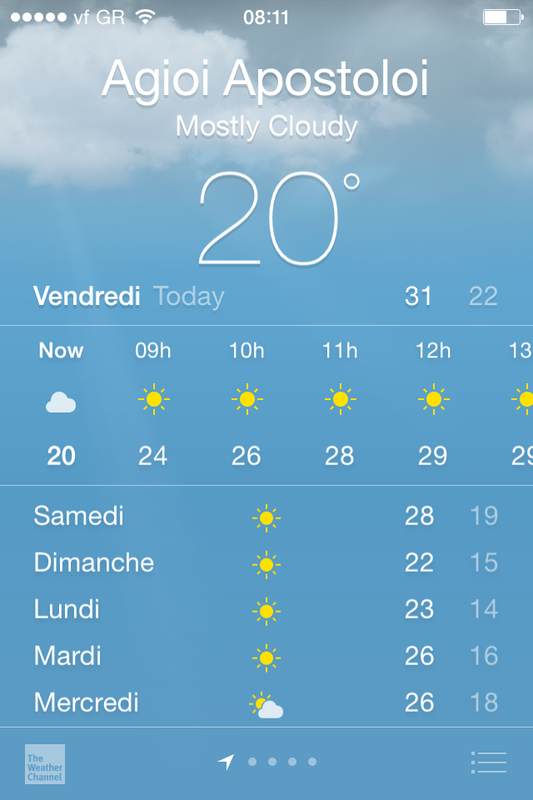 If one thing is sacrosanct in France, it’s vacation time. And when the schools close in July and August, it’s more than just the summer holidays: these are les grandes vacances. A question of only slightly lesser importance than ‘où’ is: ‘Quand?’ When you are leaving is almost as vital as where you are going. And as with any question of faith, there are different schools of belief. The two main camps are those who go away in July – les Juilletistes – and those who wait until August – les Aoûtiens. Les Juilletistes – These are people who just can’t wait to get away. 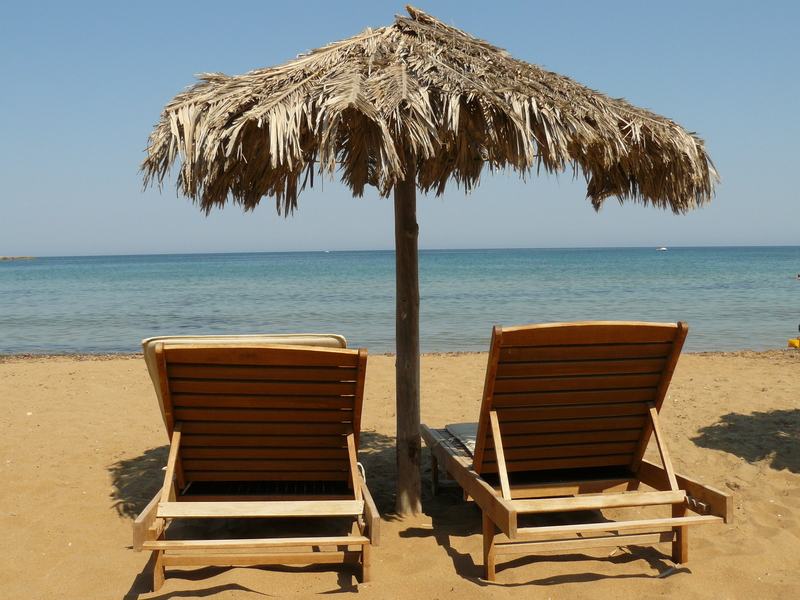 They long to be first and to come back tanned and relaxed while everyone else is still stressed. And they look forward to a second break when they return during the dead weeks of August. No traffic. No line-ups at the lunch counter. Hardly anyone haunting the office. Not surprisingly, Juilletistes are viewed with suspicion and perhaps a hint of envy. Les Aoûtiens – They are the traditionalists, the moral majority. Also the self-employed (moi). They are the worker bees. They cannot afford to take off before the half-year financial results have been put to bed, the president has spoken to the nation on the 14th of July, and it is safe to assume that France has rolled up its sidewalks for a long summer’s sièste. I’m normally an Aoûtienne. Not just for the reasons above, but because I’ve always found it unbearable to be coming back to work when everybody else is on their way to the beach. But this summer is different…this year we have decided to stay put. We’ve been intending to do this for years. Ever since we entered that enviable bracket of those whose kids have flown the nest and are no longer required to stick to le calendrier des vacances scolaires. When prices often double in France. For once, we decided to be smart and enjoy the summer in our own backyard. Then take a break in the lower season when most people are back at work. I didn’t think this would be a problem. I’m a real homebird and looked forward to enjoying the season in our parts for once. We’re lucky enough to live in a beautiful region that attracts a lot of people on holiday. We have a lake nearby and a pool. And this year, this idyllic location has attracted quite a few of our own family as visitors. So we’ve been busy. But I have to say it feels wrong somehow not to be going anywhere. Last year it was Corsica and the year before, Dubrovnik. Both of which were beautiful. Now, without a trip in the offing, I’m feeling a little antsy. There’s an expression for this in French: ‘Il faut se dépayser.’ You need to get away, discover something new, have a change of scene. Don’t you love the fact that the French have specific words to describe the need for a holiday? And for different summer vacationers? What about you? Juilletiste, Aoûtien or not at all? For those who read French, this article from Le Figaro drolly explains the entire philosophical debate around the choice.